Born on 20 October 1888 into a Minhas Rajput family in the village of Dab in Chakwal District (then a tehsil of District Jhelum) of the Punjab Province, British India (now Pakistan), Khudadad Khan was a Sepoy in the 129th Duke of Connaught's Own Baluchis, British Indian Army (now 11th Battalion The Baloch Regiment of Pakistan Army). The battalion formed part of the Indian Corps, which was sent to France in 1914, to shore up the British forces fighting on the Western Front during the First World War. In October 1914, the Germans launched a major offensive in northern Belgium, in order to capture the vital ports of Boulogne in France and Nieuport in Belgium. In what came to be known as the First Battle of Ypres, the newly arrived 129th Baluchis were rushed to the frontline to support the hard-pressed British troops. On 31 October, two companies of the Baluchis bore the brunt of the main German attack near the village of Gheluvelt in Hollebeke Sector. The out-numbered Baluchis fought gallantly but were overwhelmed after suffering heavy casualties. Sepoy Khudadad Khan’s machine-gun team, along with one other, kept their guns in action throughout the day; preventing the Germans from making the final breakthrough. The other gun was disabled by a shell and eventually, Khudadad Khan’s own team was overrun. All the men were killed by bullets or bayonets except Khudadad Khan who, despite being badly wounded, had continued working his gun. He was left for dead by the enemy but despite his wounds, he managed to crawl back to his regiment during the night. Thanks to his bravery, and that of his fellow Baluchis, the Germans were held up just long enough for Indian and British reinforcements to arrive. They strengthened the line and prevented the German Army from reaching the vital ports. 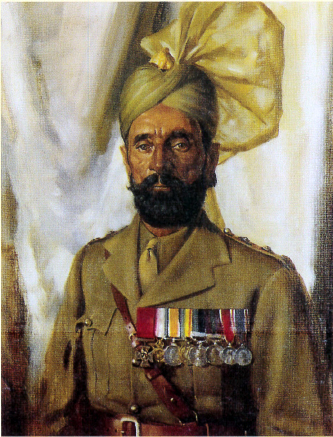 For his matchless feat of courage and gallantry, Sepoy Khudadad Khan was awarded the Victoria Cross. Khudadad Khan retired as a Subedar. He died in 1971 and is buried in Chak No. 25, Mandi Bahauddin. His Victoria Cross is on display at his ancestral house in Village Dab (Chakwal), Pakistan.